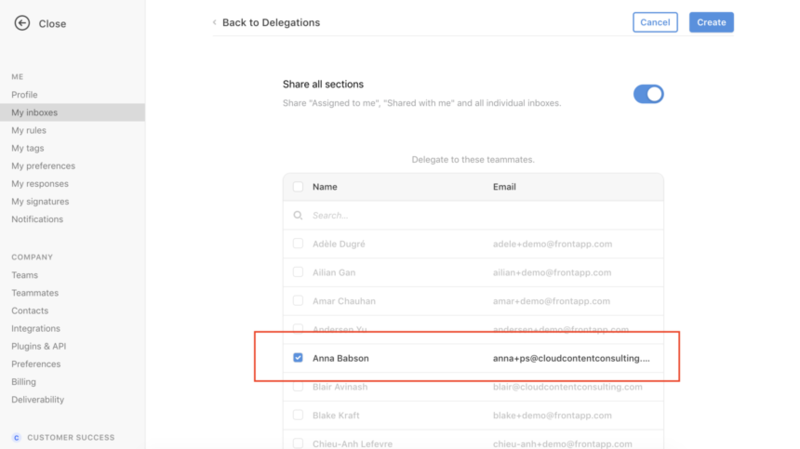 Individual inboxes are a great way to manage your own emails, but sometimes it’s helpful to give teammates or your manager access to your inbox for easier collaboration. 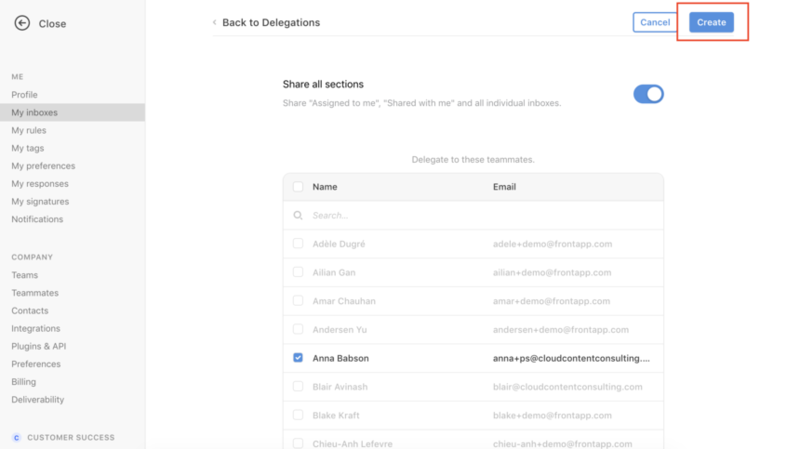 You can share your individual inbox with teammates in Front by using our delegated inbox feature. 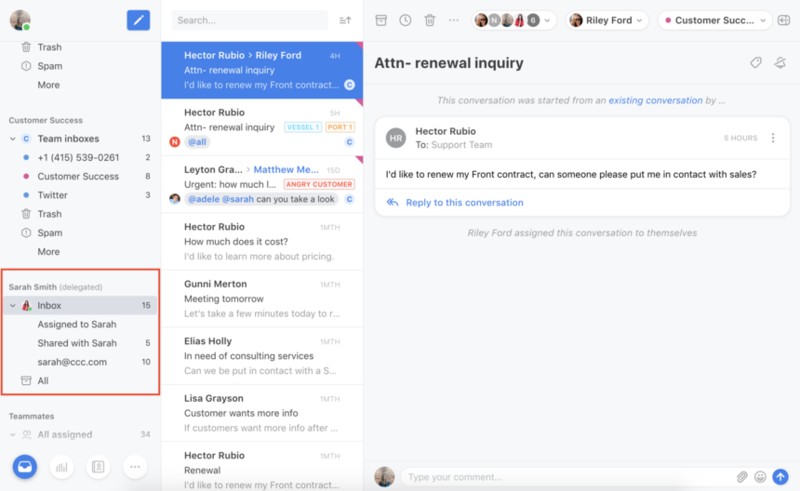 This feature will allow your teammates to view the conversations in your inbox, and work with you on achieving Inbox Zero by taking actions like archiving or snoozing for you. They can also reply to conversations in your inbox but will reply from their own email address (cannot reply as you). 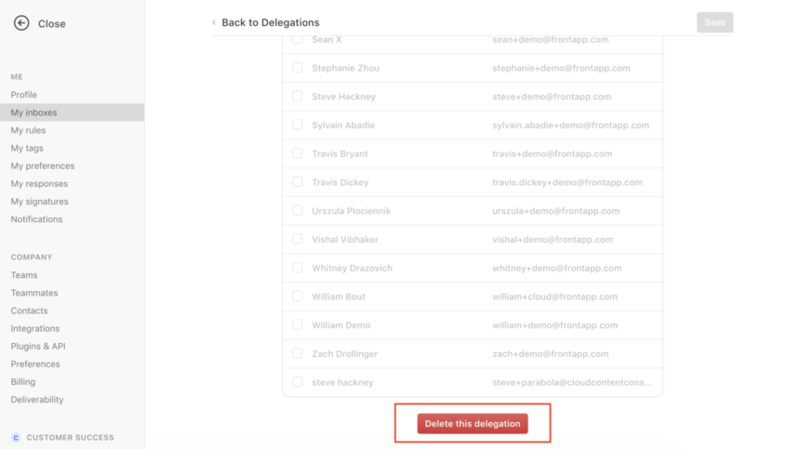 When you delegate your inbox to a teammate and share all sections of your inbox, they will also see any private tags you have pinned to your workspace. This allows them to access messages you have dragged from your inbox into a private tag, so they aren’t missed. Open Settings by clicking on your profile image in the upper left corner of Front, and then click My inboxes. 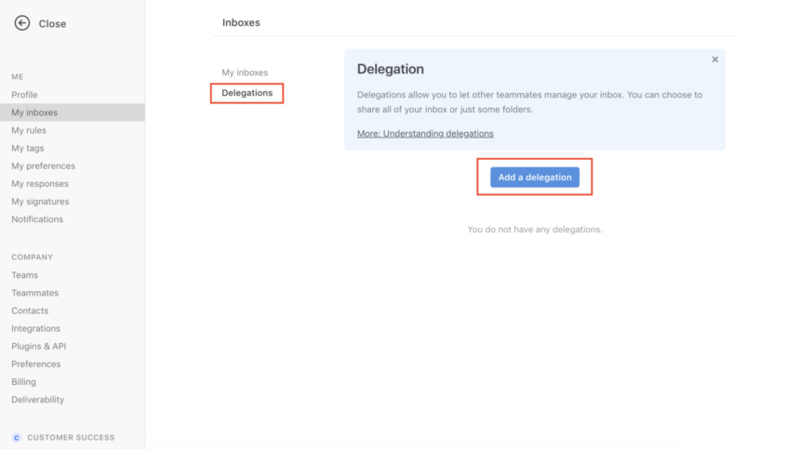 Click Delegations in the left tabs menu on the My inboxes page, and then click on Add a delegation. Select the teammates whom you’d like to give access to your inbox. These teammates will have access to see your "Assigned to me" and "Shared with me" sections and any individual inboxes you have connected. Click Create at the top right to save your changes, and you’ll see your new delegation listed. Now your teammates will have access to see your emails so you can work together more transparently! If you’re highly collaborative with your teammates, it’s a great way to make your workflows more efficient. Click on a delegation to view its details or edit it. To delete a delegation, scroll all the way to the bottom of its details page and click Delete this delegation. 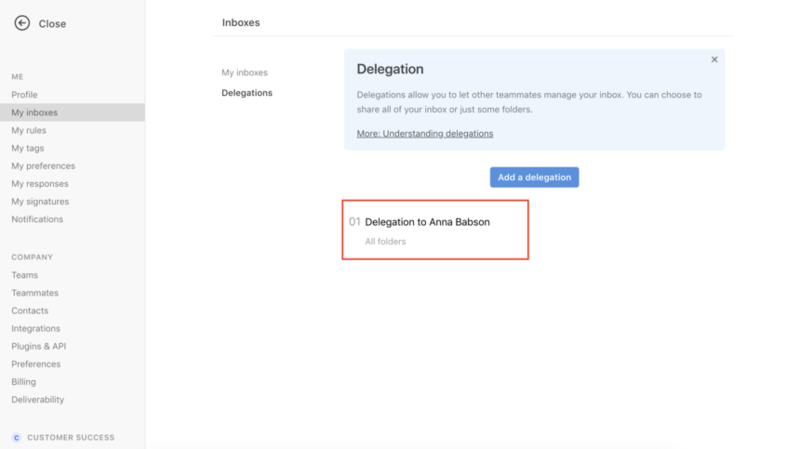 Once you’ve created your delegation, any teammates with access to your inbox will see a new section in the left workspace panel of Front, with your name as the section header. The new section will be located below your Teams section, and above your Teammates section. Below your name in the new section, they will see the same rows and counters that you see in your personal workspace: “Inbox”, “Assigned to me”, “Shared with me”, individual inboxes, and “All”. They will see the exact same content that you see when you click into these sections. 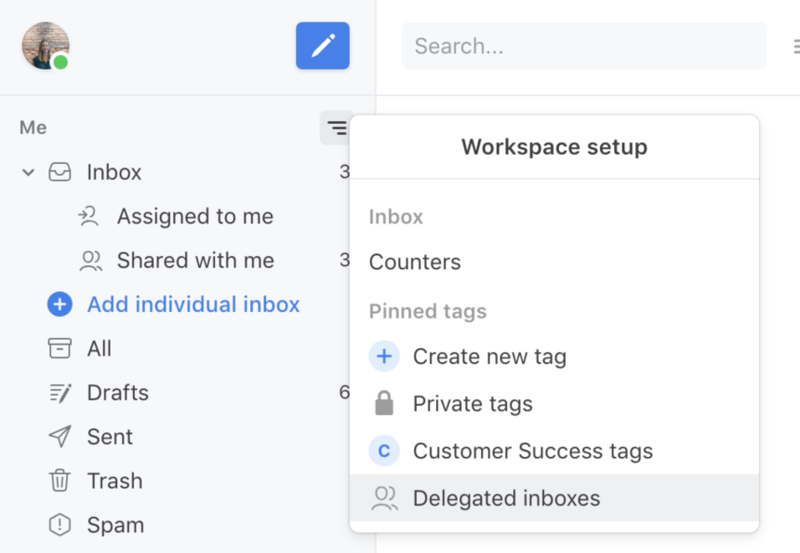 If you do not want to display an inbox that's been delegated to you in your workspace panel, click on the Workspace options icon in your personal workspace, choose Delegated inboxes, and unpin the inbox. You can pin it at any time by accessing this same menu to display it again. You may have multiple individual inboxes connected to Front, like your work email address and your personal email address. 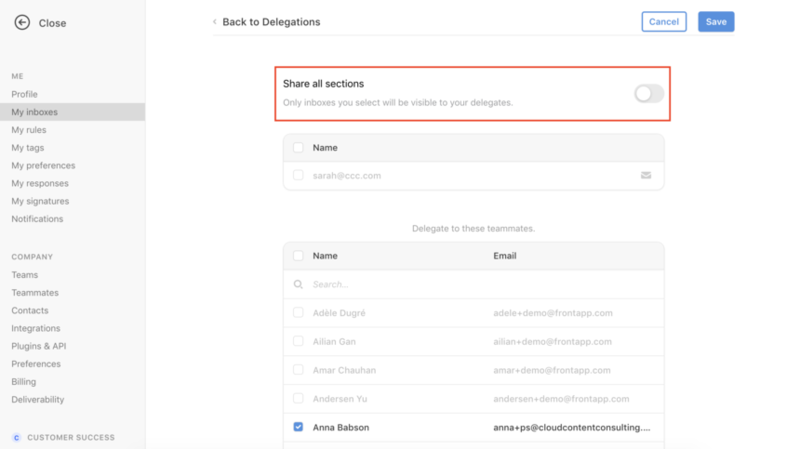 If you only want to share a subset of your individual inboxes with your teammates, you can do so by toggling off Share all sections as you create or edit your delegation. You can then select the specific individual inbox(es) to share. Your teammates will then only be able to view the contents of the specified individual inbox(es). Note: Disabling Share all sections limits what your teammates can access from your inbox and their view of your inbox in their workspace panel. When Share all sections is disabled, teammates will not see your Assigned to me or Shared with me sections or your pinned private tags, and they will not see your inbox counters. Share all sections does not impact what the teammate can or cannot do within the inbox; this stays the same regardless of whether Share all sections is disabled or enabled.